Thailand has beautified the human foot more than any other culture has–and Thai’s consider the foot so impure that you should never touch anyone with yours, or point it at a sacred image. But Thais have a genius for making even the most mundane things pretty. 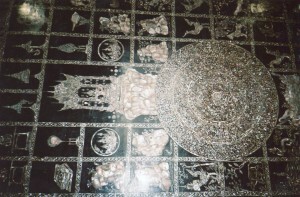 The above shot is of the heel of Wat Pho’s Sleeping Buddha. There’s a whole world in it to explore. 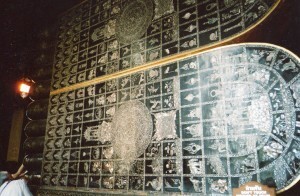 The Buddha’s footprint is an ancient art form. Legend says that the Buddha flew to Sri Lanka and left his footprint on Adam’s Peak to show Sri Lanka’s importance in spreading his teachings. Indians were making images of the Buddha’s footprint 2,000 years ago–it stood for the great teacher when his followers avoided directly making images of him. But Thais added their own aesthetics to this art form, and made it more beautiful than anyone else has. 1. 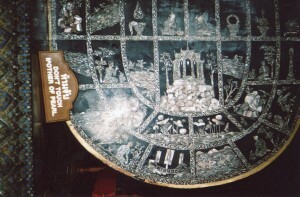 The Wheel of Law (Dharma), which you can see in the center of the foot in the above shot. The above photo is a close-up–law has never looked so pretty! 2. Mount Meru, which you can see in the heel in the top shot. A stately palace presides on its summit. 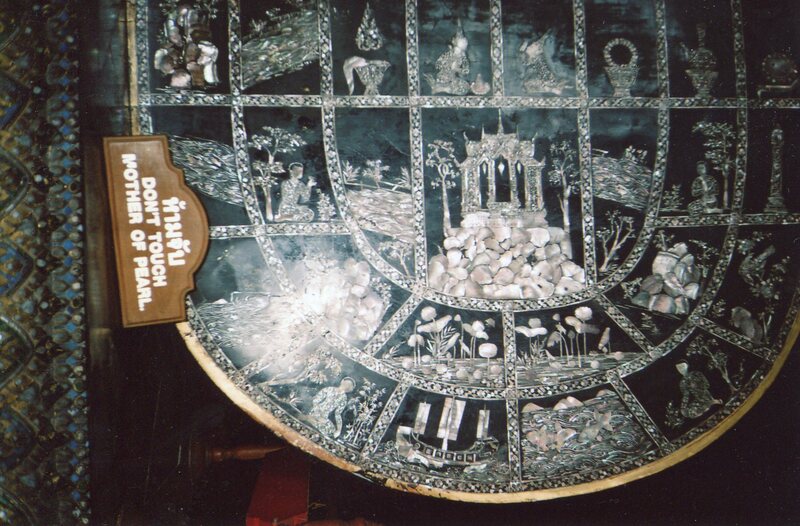 These signs on Wat Pho’s Buddha were made with mother of pearl inlay. It shimmers against the black background, and it thus seems both animated and elegant. 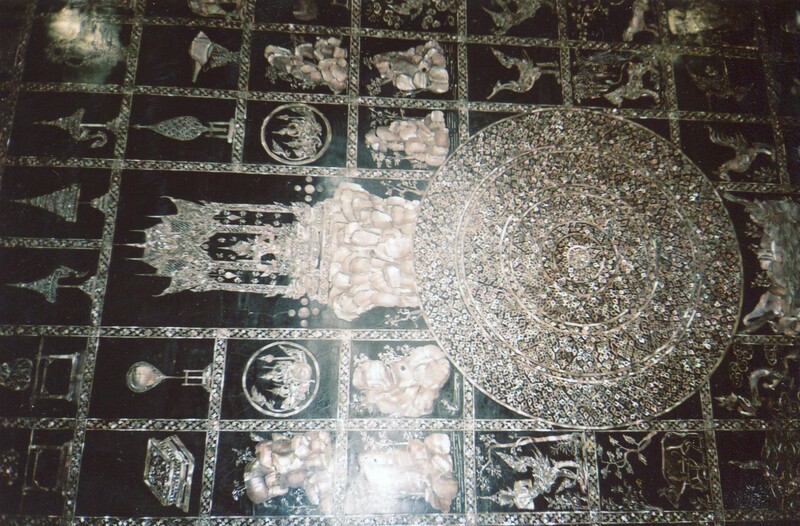 Thais developed legends about the Buddha wandering through their land and leaving his footprint in key places. In the sixteenth century, Europeans made maps of every major city with a bird’s eye view so detailed that you can follow every street and linger over every building. 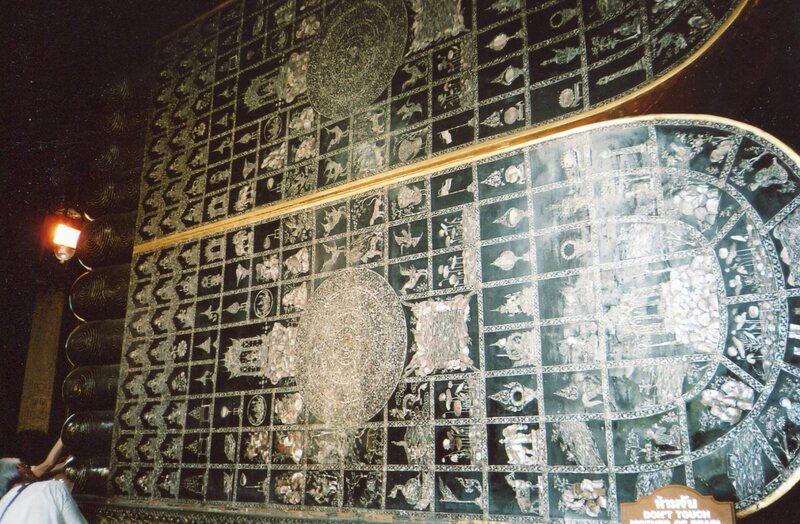 But Thais fashioned Buddha footprints in wats where they thought he taught. They conceived their land as a geography of grace, and they represented it with flowing lines and sparkling colors. It’s not scientific, but it sure is savory. I studied this FP since Aug, of 1969 and I still can not read all symbols. There is, as far as I know, not record remaining of this donation. I used it for the Ayutthaya and Bangkok exhibitions some 20 years ago. I can’t read all symbols either, but I was back in Bangkok a month ago (I’m in Cambodia now) and I took a better set of photos. I’ll publish some soon. Thanks for your comment.